Captain Joe "Bud" Russo was fishing in Jamaica Bay. He was using 12 pound test line and was using bunker for bait when he caught this beautiful 10.64 pound weakfish. Captain Russo has been a bayman since the early 70's. He has lived all his life in Howard Beach, and has a 25' Express Fisherman. His specialty is taking out fly fisherman and light line anglers. Fishing for weaks and stripers in the spring and summer. Then fishing for tautog and seabass in the fall. 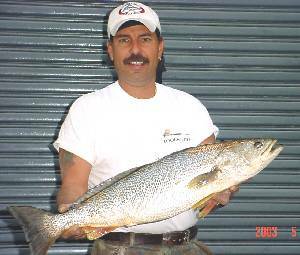 The current state record weakfish was caught by Dennis Rooney, of Seaford, NY on October 11, 1984. This incredible fish weighed 19.2 pounds. Weakfish are starting to make a come back and are being caught more often by recreational fisherman. Fresh bunker makes a great bait, because he also caught this 32 pound striper as well. There were lots of blue fish mixed in with the weakfish and stripers so it was necessary to use a small wire leader. That 12 pound test line is no match for the teeth of a blue fish and tying on hooks is not as much fun as catching fish. The Striped Bass is the largest member of the sea bass family. Striped Bass can live up to 40 years and can reach weights greater than 100 pounds. The Striped Bass is anadromous and may ascend streams and travel as much as 100 miles inland to spawn. The native range is along the Atlantic coast east of the Appalachian Mountains from New Brunswick south to Florida. The Striped Bass is a very important sport and commercial fish throughout its range. Striped Bass feed most actively at dusk to dawn, although some feeding occurs throughout the day. During the summer they tend to become more nocturnal feeding mostly at night. Striped Bass eat a variety of foods, including fish such as alewives, flounder, sea herring, menhaden, silver hake, smelt, sea robins, porgies, and eels. They will also feed on lobsters, crabs, soft clams, small mussels, sea worms, and squid. They have a voracious appetite and will eat almost anything that moves. 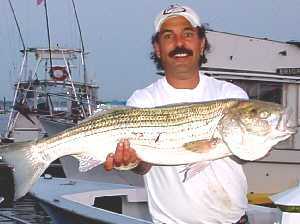 Stripers are particularly active with tidal and current flows and in the wash of breaking waves along the shore. As the surf pounds the shoreline small fish, crabs, and clams become easy prey as they are tossed about in turbulence of the breaking surf.